Monit is a free open source and very useful tool that automatically monitors and manages server process, files, directories, checksums, permissions, filesystems and services like Apache, Nginx, MySQL, FTP, SSH, Sendmail and so on in a UNIX/Linux based systems and provides an excellent and helpful monitoring functionality to system administrators. The monit has user friendly web interface where you can directly view the system status and setup up processes using native HTTP(S) web server or via the command line interface. This means you must have web server like Apache or Nginx installed on your system to access and view monit web interface. Monit has a ability to start a process if it is not running, restart a process if not responding and stop a process if uses high resources. Additionally you can also use Monit to Monitor files, directories and filesystems for changes, checksum changes, file size changes or timestamp changes. 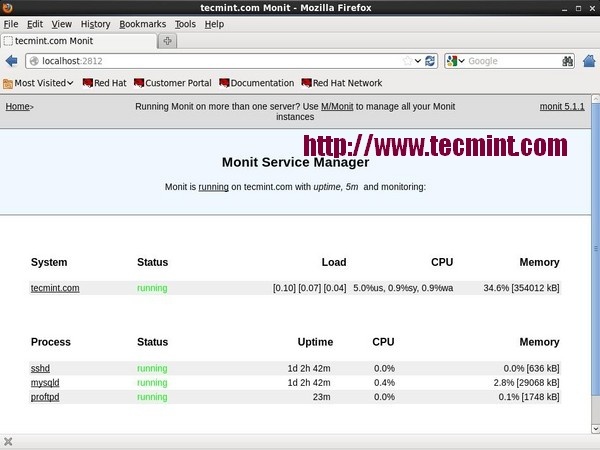 With Monit you can able to monitor remote hosts TCP/IP port, server protocols and ping. Monit keeps its own log file and alerts about any critical error conditions and recovery status. This article is written to describe a simple guide on Monit installation and configuration on a RHEL, CentOS, Fedora, Ubuntu, Linux Mint and Debian Linux Operating Systems, but it should be easily compatible to Scientific Linux as well. By default, Monit tool is not available from the system base repositories, you need to add and enable third party epel repository to install monit package under your RHEL/CentOS systems. Once you’ve added epel repository, install package by running the following yum command. For Ubuntu/Debian/Linux Mint user’s can easily install using apt-get command as shown. Monit is very easy to configure, in fact the configuration files are created to be very easily readable and making them easier for users to understand. 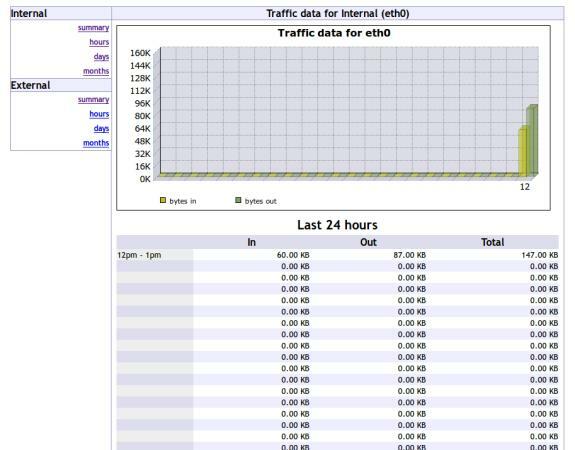 It is designed to monitor the running services in every 2 minutes and keeps the logs in “/var/log/monit“. 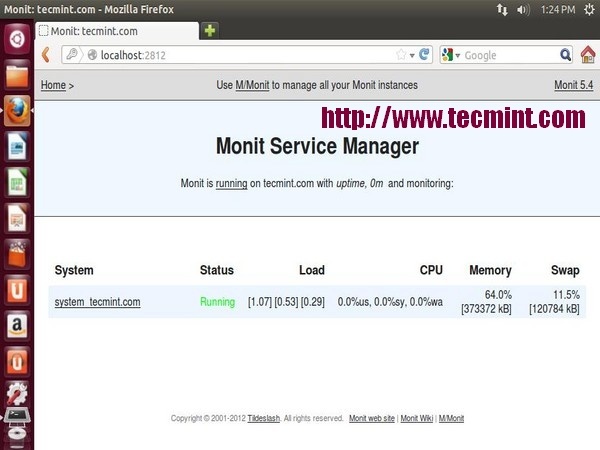 Monit has it’s web interface that runs on port 2812 using web server. To enable web interface you need to make changes in monit configuration file. The main configuration file of monit located at /etc/monit.conf under (RedHat/CentOS/Fedora) and /etc/monit/monitrc file for (Ubuntu/Debian/Linux Mint). Open this file using your choice of editor. Next, uncomment the following section and add the IP address or domain name of your server, allow anyone to connect and change monit user and password or you can use default ones. Once you’ve configured it, you need to start the monit service to reload the new configuration settings. Now, you will able to access the monit web interface by navigating to the “http://localhost:2812” or “http://example.com:2812“. Then enter user name as “admin” and password as “monit“. You should get screen similar to below. Once monit web interface correctly setup, start adding the programs that you want to monitor into the /etc/monit.conf under (RedHat/CentOS/Fedora) and /etc/monit/monitrc file for (Ubuntu/Debian/Linux Mint) at the bottom. Following are some useful configuration examples for monit, that can be very helpful to see how a service is running, where it keeps its pidfile and how to start and stop a service etc. start program = "/etc/init.d/httpd start"
stop program = "/etc/init.d/httpd stop"
start program = "/etc/init.d/mysqld start"
stop program = "/etc/init.d/mysqld stop"
Once you’ve configured all programs for monitoring, check monit syntax for errors. If found any errors fix them, it’s not so tough to figure out what’s went wrong. When you get message like “Control file syntax OK“, or if you see no errors, you can proceed ahead. After fixing all possible errors, you can type the following command to start the monit service. You can verify that monit service is started by checking log file. This is how looks monit after adding all process for monitoring. Do it monitor multi remote servers ? yes, but i see monit has useful function auto restart service when fail or not running, that a great !!! No nagios plugin doesn’t provide auto restart of services functionality.. This tutorial is very good. I’m using Debian8, Nginx and ISPConfig. The article does not cite whether it needs or works with Apache or Nginx. So, will it work to monitor any service, either one or the other, and the rest, correct? Not able to install the monit package.. can you please help? I am looking for a tool that lists/logs all “read / write / sent / received” activities of any process in detail additionally. Is that possible with this tool? It would also be nice to restrict a critical process instead of deleting it like security tools like to do. I am also looking for a tool that monitors installation activities and maybe backups modified system values or at least let me know. Could anyone give me an advisement? I need also be sure about any access for example keyboard and mouse or other peripherals. Those psycho attacks are state of the art and there is no easy way to get sure about it so far or I just haven t found the right tool yet. Thanks for pointing out that typo, corrected in the article..